Cannon Mountain, North Kinsman, and the Lonesome Lake area are widely popular amongst casual and serious hikers in all seasons. On a good-weather day, all it takes is one glance from a scenic vista looking over Franconia Notch at Mt. Lafayette and Franconia Ridge to see why. Of course, the trailhead location amid Lafayette Campground with its own I-93 exit is also a contributing factor. Cannon Mountain and North Kinsman loop via the Lonesome Lake Trail, Hi-Cannon Trail, Kinsman Ridge Trail and Fishin’ Jimmy Trail; 10.4 miles (round trip); Pack the Aleve. In general I recommend tackling North Kinsman first as the Fishin’ Jimmy Trail is a tough descent; however, I went in the other direction in an attempt to reach the Cannon summit before an oncoming weather front obstructed the views. Winter hiking on the Lonesome Lake Trail is good for adventurers of all ages and abilities. Unless you hike the Lonesome Lake Trail in the middle of a snowstorm, chances are you’ll find it well packed. It’s easy enough to bare-boot this trail as it gradually snakes its way upward. At 0.4 miles I made the right-hand turn onto the Hi-Cannon Trail, which, by comparison, is more of a tightly wound slinky. The Hi-Cannon Trail is the path much less traveled, and yes, that makes all the difference. Hi-Cannon is steeper, narrower, and much less traveled. For those looking to sweat a little more, it’s well worth detouring from the Lonesome Lake highway (isn’t it ironic, don’t you think?). That said, in transitional seasons when there’s a lot of ice, or when visibility is bad, it’s best to avoid this path. After passing the intersection with the Dodge Cutoff (a bailout option leading to Lonesome Lake), the trail gets rougher, traversing a ridge with steep drop-offs to the right. Through this stretch there are a lot of exciting peek-a-boo views of Mt. Lafayette and Franconia Ridge. Only a couple people had hiked Hi-Cannon before me since the previous snowstorm and I managed fine in microspikes. Had I not already known about the ledge and ladder that was upcoming, I probably would have gone with snowshoes. There’s one steep and tricky spot where I broke out the mountaineering axe, but, if I’m being honest, it was more because I wanted to geek-out with the axe than absolute necessity. Of course, there are some good reasons the Hi-Cannon Trail is less trafficked. This ladder going up a ledge may be one of them. Once above the ladder ledge the trail flattens out with lookouts over Lonesome Lake. So…this is what it feels like to be a rabbit in winter. Hi-Cannon goes up for a bit again before joining the Kinsman Ridge Trail. From here it’s 0.4 miles to the summit of Cannon Mountain, atop which there’s an observation tower with 360 degree views. The top-side view of a Cannon Mountain ski lift as seen from the observation tower. 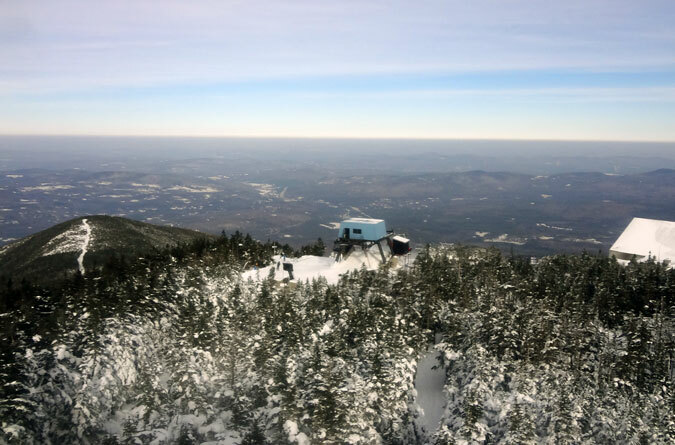 On a good day, the view from the summit of Cannon Mountain is extraordinary. This shot is looking across Franconia Notch at Mt. Lafayette, Mt. Lincoln, and Franconia Ridge. A look in the other direction reveals the Kinsman Ridge Trail course to North Kinsman. I was a little nervous for the descent of Cannon via the Kinsman Ridge Trail, knowing it has a steep stretch filled with large boulders. While a little icy, the snow was packed in around the rocks and I faired okay in microspikes. Those ascending this section may want to consider wearing full crampons. My one exception to “fairing okay” was a treacherous spot where the trail crosses a protruding rock ledge that drops straight into a washed out ravine. The smart move here would have been to climb up and around. Next time I’ll make the smart move. In the event my mother reads this, let’s just say I made it. The steep, icy, treacherous sections of trail never look as intimidating in the photos. Believe you me when I say this part is worth going above trail to avoid. From the Kinsman Ridge Trail’s intersection with the Lonesome Lake Trail, it’s 2.4 miles to the four-way junction with the Fishin’ Jimmy Trail, the Kinsman Pond Trail, and the Appalachian Trail ascent of North Kinsman. This stretch begins with a steep uphill jaunt and features two more quick up and overs covering the Cannon Balls. With snowshoes on I found this section quite enjoyable. A path had been broken, but previous traffic was minimal, leaving the snow deep and pillowy. All of which changed once connected to the Appalachian Trail ascent of North Kinsman. This last hurrah to the summit was hard packed with several steep and icy sections that required traction. The ascent to the North Kinsman summit on the Appalachian Trail has a few steep and icy sections. There’s a lookout just off the North Kinsman summit with a great view over Cannon Mountain and across the way to the Franconia Ridge’s lineup of (from left to right) Mt. Lafayette, Mt. Lincoln and Little Haystack Mountain. The view of Cannon Mountain followed by Franconia Ridge as seen from a lookout near the summit of North Kinsman. To complete the loop I descended via the Fishin’ Jimmy Trail, which is also the Appalachian Trail. This section has several steep and challenging spots that are sheer rock in the summer—in winter, the rock is lathered with ice. Traction is a necessity. You can get away with microspikes, especially if you go off-trail to get around the more technical spots, but crampons for the ascent are recommended. 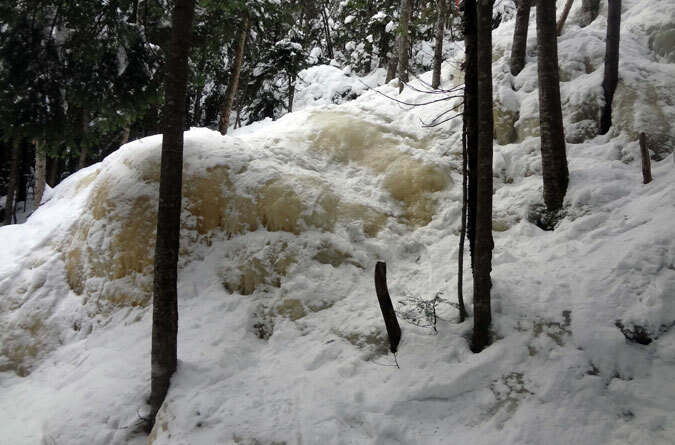 A steep and icy section of the Fishin’ Jimmy trail on North Kinsman. While it would add a little more than a mile to the trek, day hikers may want to consider descending via the Kinsman Ridge Trail connecting to the Lonesome Lake Trail to avoid Fishin’ Jimmy’s icy ledges. For those staying the course on Fishin’ Jimmy, allow for extra time. Even when you get past the steep upper section, the lower part has several up and downs that seem to drag out the two-mile trail. The Lonesome Lake Hut in winter. The Lonesome Lake Hut is one of the few AMC huts that remains open in the winter. It’s all self-service this time of year, which is to say you’re responsible for your own food. There’s one caretaker who stays on in the winter to assist guests with their reservations. In the winter the Lonesome Lake Trail takes a shortcut. Take I-93 in New Hampshire to Franconia Notch. Northbound traffic can park in the trailhead lot for the Falling Waters and Old Bridle Path trails (there’s a walking path and tunnel that goes under I-93 to where the Lonesome Lake Trail can be accessed). Southbound traffic should exit at Lafayette Place Campground. The parking lots fill up quickly (even in winter) so it’s best to arrive early.